Most Class 4 and many Class 3B lasers present an eye hazard over very long distances and it is therefore important to have comprehensive laser safety protection in place wherever they are present. Laser radiation must be prevented from escaping through the windows of laboratories and production facilities. Ordinary curtains or screens are rarely capable of stopping a laser beam and specially-designed blocking products are required. Lasermet’s laser blocking roller blinds are designed as a passive guarding system to block laser light from escaping the theatre, laboratory or laser facility where Class 3B or Class 4 lasers are in use, either to protect against accidental exposure to the laser beam or for long term blocking of laser radiation at lower power densities. 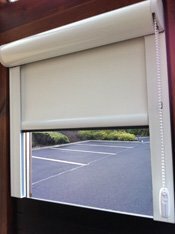 Standard laser blocking roller blinds with guide wiresThe blinds can be operated manually by chain or crank handle.